Born Eau Claire, Wisconsin, August 3, 1972; married; 2 children. Graduate Eau Claire Memorial High School, 1990; studied biotechnology, University of Wisconsin-River Falls, 1990–92. Member: Eau Claire Area Chamber of Commerce; Wisconsin Anti-Human Trafficking Consortium. 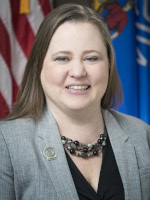 Former member: Wisconsin Human Trafficking Advisory Council; Wisconsin Anti-Human Trafficking Task Force; Wisconsin Parent Teacher Association; Girl Scouts; Eastside Hill Neighborhood Association Steering Committee.